E. Cuniculi (Encephalitzoan cuniculi) is a tiny protozoan, a one-celled organism. It is found in the environment and can affect animals and humans. In order to survive it has to live within a host which is mainly a rabbit. 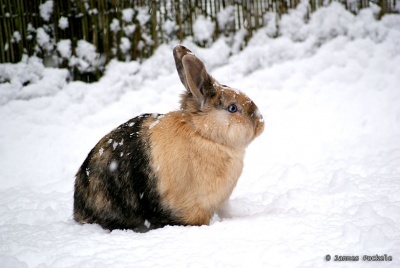 Your rabbit can become infected with E. Cuniculi several ways – from mother rabbit passing it to her kits through the placenta, from ground spores sticking to feet and then licking them, from ingesting something that has urine on it and becoming infected. 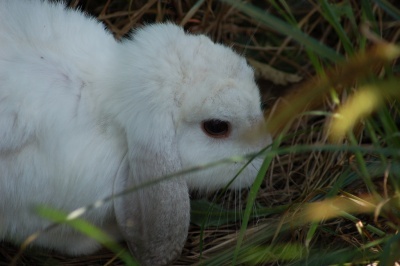 Infection can occur when the rabbit sheds spores which are invisible to the naked eye. The spores can last a few days to a few weeks. Symptoms of the disease can be head tilt, weakness or paralysis of the hind legs, neck spasms, circling, falling, eye problems, urinary incontinence. E. Cuniculi affects mainly the brain, spinal cord, liver and kidneys and can cause permanent neurological damage, liver damage and kidney damage. Otherwise healthy rabbits will show signs of the disease when another health problem shows itself. Diagnosis is through blood tests which only show exposure to E. Cuniculi, but not infection. Urine is tested, but the parasite is shed only after 3-4 days after infection. Treatment involves using steroids and anti-inflammatory drugs and the anti-parasiticide, Panacur for 28 days. While the parasites can live for a month, they are sensitive to household disinfectants. However, care should be taken with their use as they can be toxic to rabbits. E. cuniculi can be controlled by having your rabbit blood-tested. 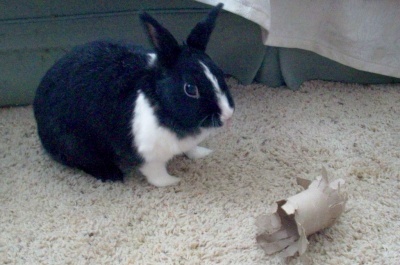 In multiple rabbit homes, make sure to test all of them. If any of the tests come back positive, treat all the rabbits with Panacur for 28 days as a preventive. Keep the rabbit’s environment as clean as possible. 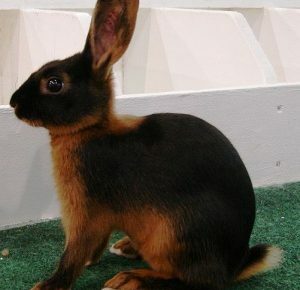 House training your rabbit to use a litter box can contain infection as well. Wash hands well after cleanup. Protect yourself by trying to avoid kissing your rabbit on the mouth.